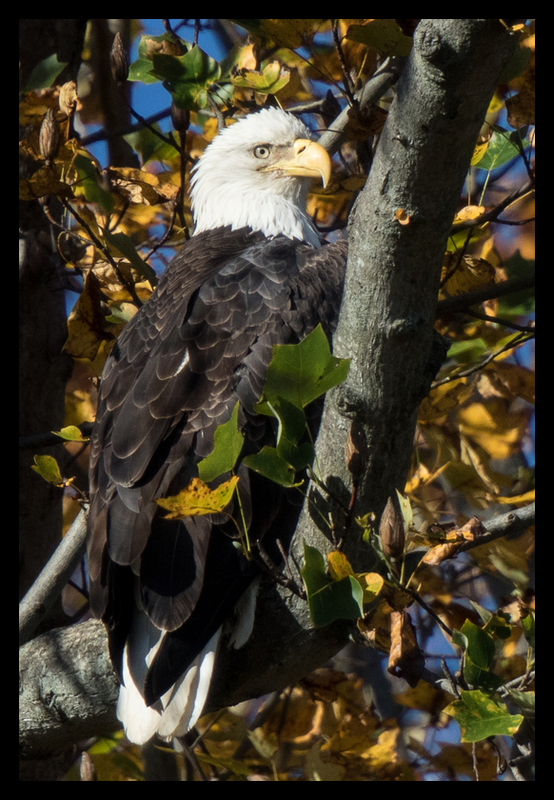 Once you fall for bird photography, the Conowingo Dam in Maryland beckons. The hydroelectric dam on the Susquehanna River is known to attract dozens of bald eagles in the fall. In their wake, an equal number of photographers and long, fast teles show up for an annual ritual of fishing, photographing and freezing. The eagles, opportunists that they are, come for the fast food delivered to them courtesy of the Exelon Power Corporation which operates the dam several times a day, in the process stunning the fish that make the trip through the generators and making them easy prey for the big birds. Like few other places, this predictable ritual allows photographers multiple spray-and-pray runs at fishing eagles and thus increases the chance for the money shot. One hour at Conowingo can deliver more payback than many freezing hours along the Hudson in mid-winter, as I can attest based on personal experience. The season starts at the end of October and runs through the beginning of December, although there are always some eagles around. The height of the hunt is apparently around the Thanksgiving holiday. On weekends, the crowds of photographers, fishermen and onlookers do get large and parking space limited, but weekdays are manageable. I was there at the end of October for two days and will return later this week for three days. I will write a detailed guide based on my experiences and talks with local shooters who have photographed here for years. For now, a few quick impressions and images. There are more large telelenses along the river here than at a pro game and some call the lineup of photographers the 'million-dollar row,' based on the value of all that top gear. I'm not sure how far the eagles fly to reach the dam, but the photographers do fly in from far away. I met one photographer who was visiting for about a week from California and another one who came from Bangkok, Thailand, by way of Banf, Canada. Then there are the lucky ones who live close by and can 'do' the dam on their lunch break or before heading into work. Going in October is a bit of a mixed bag. On the one hand, the eagles are not as abundant as in November, so there is less action. On the other hand, the leaves are still on the trees and showing their fall colors, making for a better background than bare trees. This year, the weather is still relatively warm, so standing for hours at the dam isn't - yet - as cold as it will become once the temperatures get into the normal range for this time of the season. I'm not going to go into technique yet. I'm still learning bird photography and I'm not the right person to tell others how to shoot. Moreover, the tips from people on the web and in person are all over the board. Some say you should shoot in manual mode and change your settings as the light changes. Some say you're crazy to use manual mode and should use aperture priority mode. Others will swear by shutter speed priority mode. The one thing all will have in common is that they will have to deal with the challenge of the white heads and tails of the mature eagles, which get blown out if you don't somehow compensate for them. Whether you do that using manual mode or using exposure compensation, that's up to you. At the same time, of course, you do need to keep your shutter speed high, preferably at least at 1/1600s or higher. This might mean that you need to use high ISOs, which some will find acceptable while others will leave when the light dims because the noise at the higher ISOs becomes a hindrance for them. Again, that's up to you. The same discussion reigns over autofocus modes. I'm not sure about Nikon's AF functions, but the settings on the top Canon DSLRs are so extensive that nobody seems to agree on what's the best. I'm still figuring it out myself, having come no further than identifying the main challenges to the AF system at Conowingo. Generally, for birds in flight against the clear sky, you can use all AF points and let the camera find the bird. For birds flying in front of a background or fishing in the river, most use the center point or center points and try to track the bird. This requires practice and as the bird gets further away and thus smaller in the frame, the camera might switch focus to another area. If the water is choppy, there's also a chance the AF will jump from the bird to the water as the eagle swoops down. I shot about 3,000 images during a two-day visit (really one afternoon and one morning into early afternoon) and I'm still trying to figure out what the best settings are for my cameras and what I need to improve about my own technique. What's clear, though, is that 99% of the time you need reach. I did bring two cameras, two lenses and two teleconverters: the Canon 1D X and 7D Mark II, the Canon 500mm f/4 IS II and 100-400mm f/4.5-5.6 IS II and the 1.4x III and 2x III converters. The 500mm was on an Induro tripod with gimbal head while the shorter zoom was hanging on a Blackrapid strap or lying somewhere close to me. I mostly used the 100-400mm when an eagle flew toward me to the trees behind the parking lot or for environmental shots. It's important to have that shorter option available, since the action might sometimes be close. Still, 99% of the time the action is far away, so far that I mostly used the 7D II with its 1.6 crop factor plus the 500mm lens and the 1.4x converter, giving me 1120mm. A few times, I used the 2x converter, giving me 1600mm. What I used depended mostly on where I stood. In the early morning, many prefer the boat ramp, a small space that quickly fills up. This allows you to shoot eagles flying over the river between the shore and an island. As the sun rises, the light falls beautifully over the birds. The river is relatively narrow here, so I prefered the 1D X with the 500mm and the 1.4x converter on this spot. As you move closer to the dam, you can line up along the fence of the parking lot and still shoot in the relatively narrow space between the shore and the island. You can get by with a short setup here, meaning at least 400mm, preferably a little longer. The adventurous can climb down the rocks and get a lower view of the river here. Apparently, when the dam is running water at full force, this is where the fish float on the water, stunned by what just happened to them and the eagles do their fishing here. When the dam is not running or not running at full force, the area closer to the dam will provide more action. Here you can shoot from a small beach if the dam isn't running, or from a deck alongside dozens of other photographers. The river is much wider here and you need all the reach you can afford, and then some. I exclusively used the 7D II with the 500mm and the 1.4x when I shot in this area, with the 1D X and 100-400mm reserved for flight shots. I did wish Canon made a crop sensor camera with the speed and buffer of the 1D X. 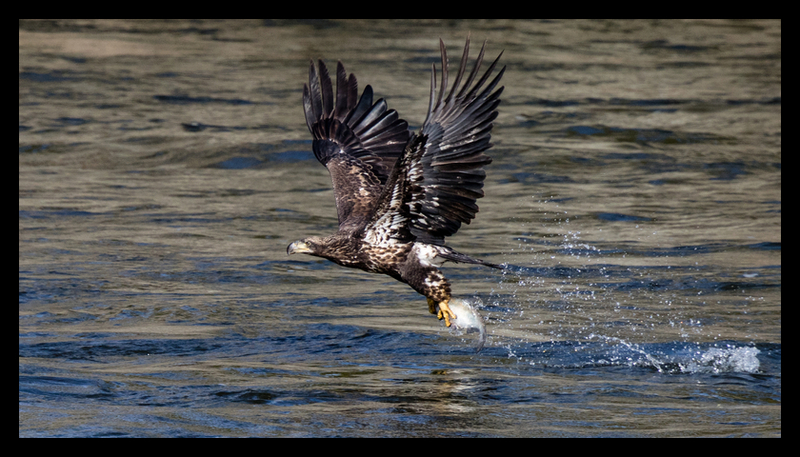 The 7D II is a great camera for bird photography, but shooting RAW the buffer fills up quicker than the one on the 1D X and you need to make sure you have space left for the critical moment that the eagle catches the fish. With the 1D X, you can just blast away. While Conowingo is a great location, there are a few challenges specific to it. The first one is that it's in a valley, so the light disappears relatively early. Driving back from it because the scene had come too dark, I found myself in sun-drenched hills. At the dam, the lights lasts longest on the far shores, visible from the observation deck, but also requiring longer lenses. The second one is the presence of the dam and its paraphernalia, which is kind of a given, but a challenge nonetheless. Your bird might fly or fish in front of the dam, fly through the power wires throwing off your AF or fly by the towers lining the river. The multitude of other birds can be a bonus, but can also mess with your AF tracking. Finally, a bit about the schedule. Word is that the power company generally runs the dam twice a day, one time in the morning and one time in the afternoon. A hot line (1-888-457-4076) provides the info for the day and is updated a 5 PM for the next day. The problem is that the information is generally wrong. I'm planning to talk with the company as I work on my guide, but from my brief experience so far I can only advise to ignore the hotline. On my first day, the dam wasn't supposed to run until after dark. When I arrived early in the afternoon, it turned out they had started running it around 11 AM, most likely to lower the water level behind the dam after a day of heavy rains. The water ran thoughout my time there, until the sun disappeared behind the trees around 5.30 PM. The second day, the hotline said they would start up around 3 PM. They generally run it at low levels, but many photographers left for lunch or went home as it was relatively quiet. I was planning to leave around 1 PM for my drive back. Then, as I was about to pack up, the sirens sounded and the hazard lights came on, warning us to leave the low-lying beach. A few minutes later, water spewed out in force, quickly flooding the area where we had been standing and delivering an hour of eagle lunch activity in its wake. Meanwhile, a lot of photographers who had just left were having their own lunch elsewhere.